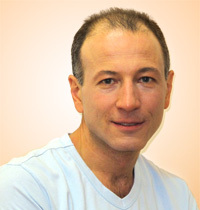 Natan Gendelman is a Manual Osteopathic Practitioner with over 30 years experience in medical and rehabilitation field. He has graduated from a 5 year program at the Canadian College of Osteopathy in the year 2006. Natan’s DOMP Diploma can be viewed here. Natan began his professional career back in the year 1984 when he attended a two year program at the Physical Culture and Sports college in Leningrad, former Soviet Union. He has graduated from the program and became licensed as a Kinesiologist and Remedial Gymnast / Physiotherapist in the year 1986. Upon his return from a two years mandatory military draft, Natan enrolled in a 4 year program of Physical Education and Remedial Gymnastics at the Herzen State Pedagogical University in St. Petersburg, Russia. 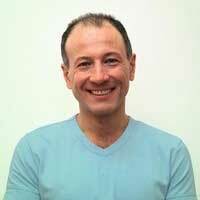 Natan immigrated to Israel in the year 1989 and got licensed as a Physical Therapist in Israel in the year 1991. Prior to that he has successfully completed an accelerated Physical Therapy Program for foreign trained therapists at the Assaf - Harofeh Physical Therapy School at the University of Tel - Aviv, Israel. Natan worked in Israel as a physical therapist from 1991 – 1997, treating a wide variety of patients of all ages who suffered from a wide range of ailments. The latter include but not limited to such conditions as open heart surgery, general surgeries, total hip and knee replacements, children and adults with neurological, oncological, spinal cord, strokes and orthopedic injuries. 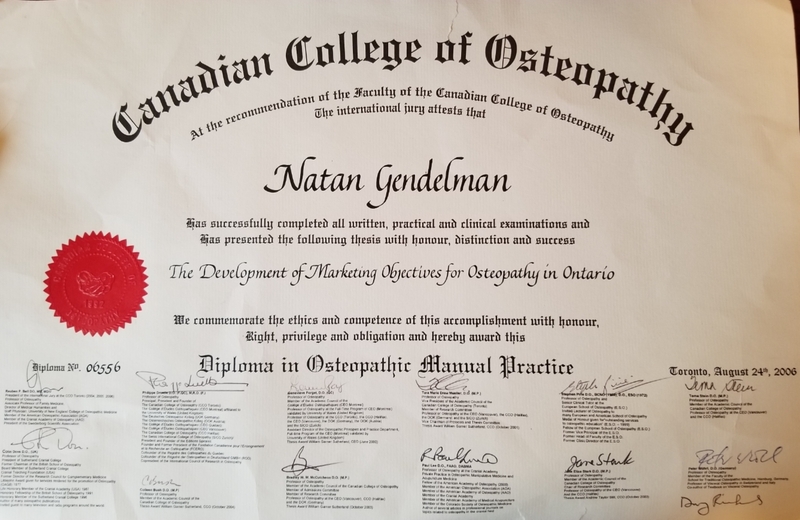 During his work in Israel Natan has underwent intensive postgraduate courses in manual therapy as well as neurological rehabilitation (NDT/ Bobath concept). In 1997 Natan moved to Canada. In 1999 he was fully certified by the Ontario Kinesiology Association and remained certified until the year 2004, when he was near completion of his Osteopathic Manual Practitioner Program in Toronto. During his practice as a kinesiologist and Osteopathic Manual practitioner, Natan developed LIFE method (Learning Independent Function Everyday) for children with severe disabilities, which has been awarded first place on 12th Warsaw Medical Congress in Pediatric Session. Over the past 10 years Natan has successfully treated hundreds of severely disabled children suffering from cerebral palsy. He taught them numerous invaluable fine and gross motor skills and improved their cognitive abilities and attention spans. Owing to Natan’s experience, perseverance, expertise and professionalism, his patients are now able to lead much more independent and fulfilling lives. If you would like to hear more about our success stories, kindly contact us directly and we will forward you all the necessary information upon request. Natan is also a past member of the Russia National Boxing Team and Israel National Boxing Team. Natan is a recognized expert who has been featured over the years in local newspapers as well as on the air in radio and TV. View Natan’s interviews. He also has his own blog, Enabled Kids, where he discusses issues related to children with neurological disorders. Visit Natan's blog. If you are a member of the media who would like to interview Natan, please contact our office at (416) 250-1904. Or, send us an email at: info@healthinmotionrehab.com. We look forward to hearing from you!